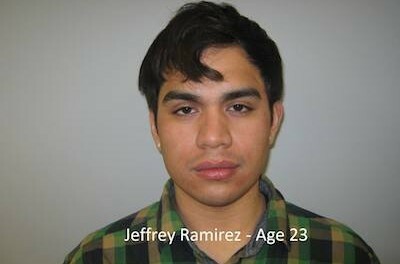 Jeffrey Ramirez, courtesy of the Sparta Police Department. 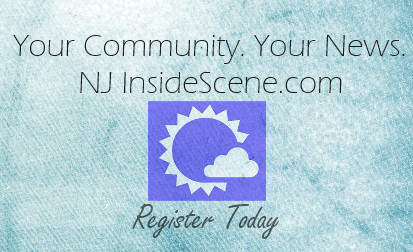 SPARTA, NJ – On 01-31-2015 at approximately 10:09 PM, Sparta Police received multiple 911 calls reporting an erratic driver traveling north on Route 15. Sgt. Jeff Mase positioned his vehicle on the jug handle near the railroad tracks at the 14 mile mark to observe traffic in an attempt to locate the reported vehicle. Sgt. Mase observed a group of vehicles approaching his location with one of the vehicles pulling into the jug handle behind his patrol vehicle. The other vehicles in the group stopped at the traffic light. Sgt. Mase was flagged down by one of the motorists. The sergeant exited his vehicle and was speaking to the operator, who pointed out the suspect vehicle which was stopped behind Sgt. Mase’s vehicle. Sgt. Mase approached the vehicle identified as a silver 2006 Toyota Sequoia and directed the operator later identified as 23-year-old Jeffrey O. Ramirez of Sparta, to remain stopped. The driver immediately accelerated his vehicle towards Sgt. Mase forcing him to dive out of the way onto the pavement. The sergeant injured his back and his neck as a result. The Toyota Sequoia then sideswiped the entire length of the driver’s side of the police vehicle and fleeing at a high rate of speed, disregarding a red traffic signal and narrowly missing a collision with another vehicle in the intersection. The suspect vehicle then fled south on Lafayette Road. Sgt. Mase was able to determine the vehicle had fled onto Skyview Drive which is less than a mile from the scene. He observed the vehicle had struck a mailbox and also drove onto the lawn of 9 Skyview Drive. Sgt. Mase observed the vehicle had fresh damage to the front passenger’s side which was consistent with striking the police vehicle. Several other officers arrived to assist with the investigation. The homeowner, 53-year-old Freddy O. Ramirez (later determined to be the father of the suspect) approached Sgt. Mase and immediately became uncooperative. After being denied access into the home, officers on scene then applied for a search warrant. Mr. Ramirez was directed to remain outside the home until the search had been completed. After the elder Ramirez attempted to re-enter the residence several times after being told not to he became disorderly. As officers attempted to place Ramirez under arrest, he resisted violently. After being secured, the elder Ramirez claimed he had injured his leg and head. 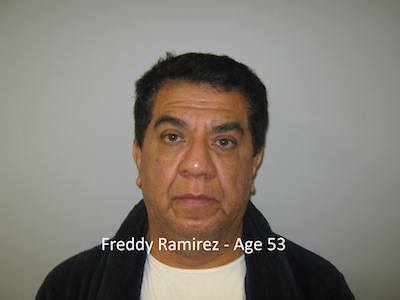 Freddy Ramirez, courtesy of the Sparta Police Department. He was transported to the Newton Medical Center under guard by the Sparta First Aid Squad where he was treated and released without incident. He was charged with; Obstruction of the Administration of Law (Fourth Degree Indictable Crime), Hindering the Apprehension of Another (Disorderly Persons Offense) and Resisting Arrest (Disorderly Persons Offense). He was processed at Police Headquarters and released later in the morning on his own recognizance. Sgt. Mase was also transported to Newton Medical Center by the Sparta First Aid Squad. He was treated for back, neck and shoulder injuries and then was released later in the morning. At this time due to his injuries the sergeant is physically unable to return to duty. After obtaining a Search Warrant, officers searched the interior. Officers located the younger Ramirez hiding in a closet. Ramirez who was highly intoxicated, resisted and fought with police as they attempted to take him into custody. He was physically subdued and transported to Headquarters for processing. Ramirez remained disorderly and combative during the time he was at police headquarters. Several hours later, he too was transported under guard to the Newton Medical Center where a blood sample was drawn per a court order. He was then transported to the Sussex County Jail where he was lodged. 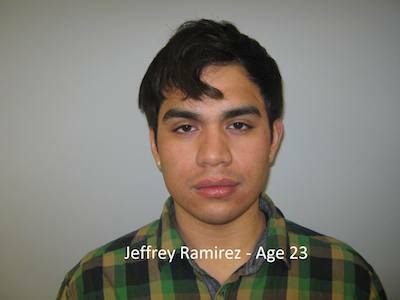 Jeffrey O. Ramirez was charged with multiple criminal charges and motor vehicle charges. He was charged criminally with Eluding a Law Enforcement Officer (Second Degree Indictable Crime), Aggravated Assault By Auto against a Law Enforcement Officer (Indictable Crime of the Third Degree) and Resisting Arrest (Indictable Crime of the Fourth Degree). The lead investigator is Det. Jeffrey McCarrick. Other officers assisting with the investigation at the scene were Det. Thomas Laird of the Sussex County Prosecutors Office, Lt. John-Paul Beebe, Det. Joseph Antonello, Cpl. Robert Fraser, P.O. Scott Elig and P.O. Tom Snyder. The incident remains under investigation and additional charges are pending against both father and son. The vehicle that was used in the commission of this crime has been seized by the Sparta Police. Forfeiture proceedings are also pending.